Network Solutions has been in business for over 30 years, and with such a long history under their belt, you would think that, by experience alone, they would be running circles around newer services. In some cases, they come close – especially when you consider the generally solid uptime and speed they provide. Alas, the shortcomings of their VPS service overshadow the things they manage to get right. To be more precise, their prices are pretty expensive while offering less options and lower specs compared to their competition. With that said, is Network Solutions still worth considering? Read on to find out! Full Root Access: The company provides full root access, which gives you unhindered capabilities to maintain or customize your system. You can, for instance, install any applications you wish. Performance: Both uptime and speed are usually quite good – not the best there is, but not bad either. Numerous Billing Terms: Network Solutions offers a wide range of billing term options, which allow you to pay monthly, yearly, every three years, or even as long as ten years. Expensive: Network Solutions’ introductory price is quite expensive, and their renewal rates even more so. If you are on a budget, this might not be the best option. Low Specs: For the price you pay, you would expect a more meaty feature-set, but Network Solutions starts you off with a paltry 1GB RAM and 10GB storage. 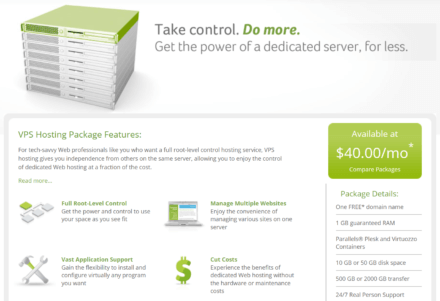 There are other VPS hosting providers out there that offer more for less. Less Options: Network Solutions only offers two VPS configurations, so for those whose needs are not covered by what the company offers, you would have to look elsewhere. Other Costs: Having to pay an extra $59.99 per month for premium support might not be an affordable option for most small businesses. Meanwhile, if you exceed your allocated monthly data transfer, you would have to pay an extra $59.99 per 25GB. Network Solutions’ VPS service is a much simpler affair than the rest of their peers. For starters, the features they offer are barebones, so if you are the bells-and-whistles type of customer, you may want to avert your attention. Still, there is a lot to like here. For starters, they offer full root access, which affords you the power to run your server however you like. You can install applications, services, or operating systems of your choosing, for instance – essentially, you get the customizability of dedicated hosting on your VPS. Beyond that, the company also provides the latest versions of Plesk and Virtuozzo Containers so maintaining and monitoring server resources are much easier. Both of their VPS plans, meanwhile, come with a free domain name, up to 200 email boxes, and 24/7 support. As you can see, there really isn’t much on offer, and the specs of each configuration pale in comparison to others that offer similar (or better) features for much less. Still, it is great that you can manage at least 10 websites right off the bat, and the fact that you get 50 email boxes can certainly benefit businesses. However, if your needs aren’t covered by Network Solutions’ two VPS plans, then you would be better off elsewhere. For any concerns, you can contact Network Solutions’ support teams via phone or email. They provide a wide array of numbers and email addresses that correspond to a particular product or service. So if your problem relates to, say, web hosting, then you would have to contact the number or email listed for that service. Meanwhile, if you prefer to pore over self-help resources, they also provide a pretty comprehensive help center – though the formatting of their help page seems a bit wonky so you might experience some difficulty browsing properly. What's the Verdict on Network Solutions? While they have been around for over three decades, Network Solutions has, unfortunately, failed to keep up with newer web hosting providers. Make no mistake, there is value to be had here, especially if all you need is a decent VPS configuration with great uptime and speed. That said, their plans are quite pricey, but offer less compared to others. For instance, you only get 1GB RAM and 1 dedicated IP, whichever plan you choose. That would have been fine if they offered more premium configurations with more features, but they didn’t – so you will have to make do with their 2 options. Beyond that, if you need help with site migrations, backups, maintaining databases, and other advanced procedures, the company requires you to fork over $59.99 per 30 minute increments for additional support. Meanwhile, you also must pay an extra $59.99 per 25GB exceeded on your monthly bandwidth allocation. All in all, there are tons of better options out there, but if you can live with what they offer and you have the cash, you will at least enjoy the solid uptime and speed they provide.